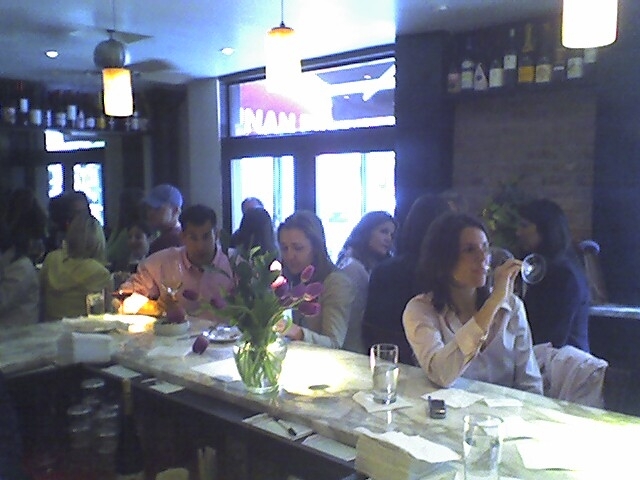 237 Columbus Ave. between 70th and 71st St.
Is the Upper West Side morphing into “wine central” New York City? That is a question we asked ourselves over lunch at the tiny wine bar, Bin 71, the other day. There seems to be wine stores and wine bars popping up every other week in the land of Fairway shoppers and Bugaboo strollers. What gives? Well, although the postage stamp sized bar was not filled to capacity on this particular, incredibly rainy Wednesday afternoon, it seems that it is bursting with revelers trying to grab a spot at the u-shaped marble topped bar every evening of the week. Suffice to say, the UWS is ripe for anything grape these days. The good news is that Bin 71 is a cozy yet sophisticated place to taste wine and experience the Italian cooking of the owner’s father, who is apparently the one making your meatballs in the tiny basement kitchen. There is a nice sized list of by-the-glass pours as well as a long one-page list of wines by the bottle. The list is interesting if not extensive and includes wines from around the world with an emphasis on Spain, France, Italy and the U.S. The bartenders are very familiar with everything on the list if you need some help deciding. In fact, everyone we met at Bin 71, including the proprieter, Lawrence Bondulich, was very cheerful and accommodating. The bad news is that I have spoken to folks who live on the Upper West Side and, although they share my enthusiasm for Bin 71, they rarely make an attempt to go because it is always so crowded. Patience, my friends, patience. A little bird told us that Lawrence is soon to open another wine joint in the hood in the not so distant future. As an aside, there is a flat screen television (not something you find in most wine bars) if you want to catch the game! It is curious that you would spend the time to review only one wine from BIN 71 and then slam it for being too tart and cooked? Was it a recently opened bottle? Did you try the wine with food? You serve neither the consumer or wine industry with a blog entry like this. Here is what the Wall Street Journal said of the Coturri 2004 Grenache - "Simply outstanding, with intense tastes of tightly wound fruit and rich earth. This wine proves, dramatically, that even reasonably priced California wines can express terroir." Let me jump in here. The only reason we "reviewed" one wine from BIN 71 was it was the only bottle we tried while we were there. This was a new bottle and we had it with various food stuffs over lunch as well as tasting it pre-food. I am sure-- and from the context of the article, Jen implied-- that BIN 71's wine list is wide and varied with a fine selection of reasonably priced offerings. Jen indicated to the blog reader that the wine was a sulfite-free bottle which may have contributed to its taste and/or it may have been a cooked bottle (unlikely IMHO). It may not be what the Wall Street Journal tasted but it was what we tasted. Was it a bad bottle? Perhaps and Jen indicated as much. If we have it again and the results are different, I am sure we would change our tune- but based on the bottle we had I doubt we would purchase it again with the plethora of wine offerings out there. It's sad to say but unfortunately a fact of the wine market. I would love to give every wine the benefit of the doubt, but how can you. Clearly you feel strongly about the wine and we hope you enjoy and continue to enjoy wines from Coturri. Your post also identifies another opinion as to the wine and we appreciate that. But to say this entry serves neither consumer or the wine industry is just plain wrong. Consumers have the right to know how certain wines fared- good or bad. Also, the winery has a right to know about the experiences of their consumers. Was it our fault that our experience did not mimic John and Dottie's? Obviously not. When you purchase a wine you make your decision based on a number of factors- vintage, regions, grapes, wineries and even wine reviews. We decided that this wine had all the right things going for it- and we came up craps. It happens. In my clearly biased opinion, Jen did a good job of providing the reader with our position with respect to the wine, in an article that was focused mainly around a wine bar. Feel free to post your review of the same wine should you have one. Just to reiterate, this was a casual post in a continuing series about wine bars in NYC. Bin 71 is a great little spot with an interesting wine list, which is all I meant to get across here. Since we happened to order the Coturri Grenache when we visited Bin 71, I felt I should mention it and register our disappointment (leaving room for the fact that it may have been an off bottle.) I was simply giving our opinion, which, as Taylor points out, is certainly serving the consumer. We have tried many wines that other people have "slammed" (even the all knowing Parker) and have enjoyed them immensely. At the end of the day, it is a matter of personal taste -- but everyone is entitled to their opinion. Isn't that what blogs are all about? Vinogirl & Winemonkey - don't you think that Lawrence at BIN 71 tasted the wine before he put it on his very limited list? Are you doubting his palette? It was undoubtedly an off bottle...so why write to the world and recommend that they stay away from this wine? I don't know what your collective qualifications are - but when you judge wines and make cavalier posts that effect peoples livelihoods and reputations - you should be prepared for the ramifications and you need to take such things into consideration the next time you "blog". And of course everyone is entitled to their own opinion - what is the saying? opinions are like a@#holes - everyone has one. The level of vitriol in anonymous’ posting makes me think he/she has some skin in this game. An objective observer might disagree with a posting, but would undoubtedly see the value in the free exchange of ideas. It would be perfectly legitimate to differ with vinogirl’s opinion, but the attempt to discredit her and her blog suggests anonymous isn’t the objective observer he or she claims to be. Instead, I wouldn’t be surprised to find that anonymous is actually an employee of Coturri making a not-too-successful attempt to squash any criticism – no matter how well deserved - of that vineyard’s wine. I should just let this thread die on its own but need to first clear the record – I do not work for the winery – my defense of the wines comes from the fact that I’ve enjoyed the Coturri wines for years and I know the Coturri family and I’m tired of fault finding pundits that just don’t “get it” and have no background to comprehend rustic and traditional wines. You would benefit from tasting the wines of Chateau Rayas, Domaine Les Pallieres from Gigondas, Catello de Lispida, a Brunello from Gianfranco Soldera, a Nebbiolo from Balgera, a Sagrantino di Montefalco produced by Paolo Bea or Montepulciano d'Abruzzo from Emidio Pepe. How about closer to home – try a blend from Edmond St. John – it will elevate your taste buds.